The NARGS Seed Exchange is dependent on the generosity of all our members who donate seed from desirable plants. Keep the diverse range of plants you grow in active cultivation by collecting and sharing seed with other members through the Seed Exchange. The Seed Exchange is only as good as the seed that is sent in so please donate seed! Seed donors are defined as members who contribute sufficient seed from at least 5 different taxa appropriate for the seed exchange. Donors receive 35 packets of seed, while non-donors receive only 25. Furthermore, Main round orders from seed donors are filled before those from non-donors. Finally, donors receive the recognition and gratitude of their colleagues! Status as a donor will be determined by the Intake Manager; see below "What to Send" and "Unacceptable Seed List" for what is appropriate. Collect seeds as they mature, remember to identify and label them when collecting. Check out Seed Exchange Helpful Links for links to help you identify what the seed should look like as well as how to clean the seed. Clean the seed by removing it from capsules, discarding all debris and chaff. If the seed is enclosed in a fleshy fruit, remove as much moist material as possible. Uncleaned or diseased seed will be discarded. Collect and send a reasonable amount of seed, enough for a minimum of 5 packets, if possible. Please make sure the plants are correctly identified before sending the seeds. The Seed Exchange is able to accept ephemeral seed if it is properly packed. This includes many spring-blooming woodlanders and some members of the Ranunculaceae family, which germinate better if not be allowed to dry out. Package the fresh-collected ephemeral seed in re-sealable plastic bags with slightly damp vermiculite. Use enough vermiculite to keep the seeds from drying out and check the bags periodically to ensure that the seeds are just damp, but not wet. Please also note on the donation form that the seeds are packed in vermiculite. Most ephemeral seed should be kept at room temperature for storage; many germinate at cold temperatures and we do not want them to germinate before the members receive the seed. We do not have the ability to keep seed refrigerated for the full length of the seed exchange so DO NOT put the moist-packed seed in the refrigerator (the changes in temperature may trigger germination). We are still working out the details with USDA Port Inspectors for allowing in seed packed in vermiculite for our non-US members. In the meantime, non-US members (and US members who do not wish to send their seed moist-packed) may still send ephemeral seed in the normal way; it is often still viable, but simply takes longer to germinate. Please send seeds in glassine, resealable clear plastic, or paper envelopes. Glassine envelopes may be purchased here. 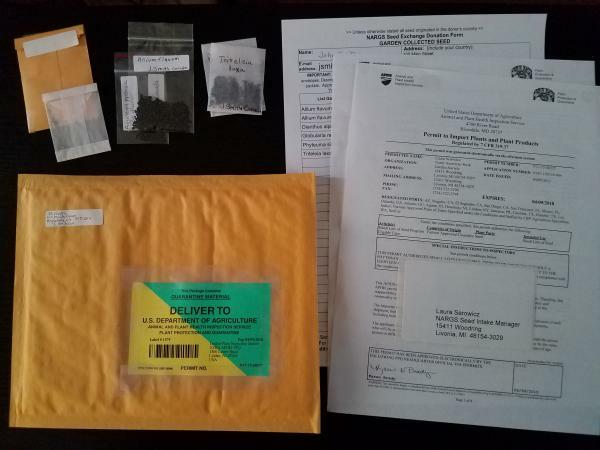 For all Overseas and Canadian donations: seed should be visible through the envelope as they must all go through the USDA Plant Inspection station; use adhesive tape, not glue, to seal the seed packets as the inspectors may need to open them for inspection and then reseal them. If using plastic bags for small seed, first enclose them in a smaller packet (glassine or waxed paper) to prevent seeds from clinging to the plastic. BE SURE THAT THE SEED ENVELOPES DO NOT LEAK! 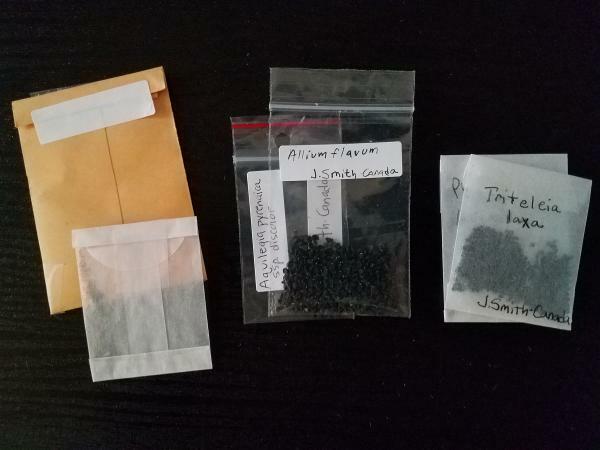 Many seeds are lost from packets that are not properly sealed, especially from the corners of the envelope. Folding down the flap an extra ¼ inch (6mm) to completely seal the opening and putting tape over corners is recommended to ensure the seeds cannot leak out of the envelope. PRINT IN VERY CLEAR GOOD-SIZED LETTERS on OUTSIDE of each packet: the botanical name with genus and species (no abbreviation of genus); collection site and country (if wild collected); color and height (if unusual). Your name (and country if outside the U.S.) is required on every seed envelope. If seeds are very moist, particularly aroids, Paeonia, Acanthus, and Iris, enclose the packet separately in plastic to prevent the moisture from ruining the rest of the seeds. You may remove the “tails” of seeds such as Clematis and Pulsatilla, and the “tufts” on seeds such as those found in the Aster or Milkweed families. Fern spores and dust-like seed should be divided into individual packets by the donor, as the seeds are so small and difficult to package. The individual packets should be small enough to fit inside the glassines used for distribution, about 1 inch/ 2.5 cm square; folded foil or waxed paper work well. The Seed Donation Form is included with the Donation Instructions insert in the Summer issue of the Rock Garden Quarterly or click on Donation Form PDF to access the form which can be filled in online, printed out and sent in with your seed donation. You can also download the PDF to your computer to fill in, print out and save a copy for your records. If you are unable to print out the PDF file contact us for a different version or you may enclose a clearly written or typed alphabetical list of the seeds you are sending (clearly marking if garden- or wild-collected), along with your name and mailing address. Including your email address on your donation form will help the Intake Manager if she needs to contact you about your donation. Fill out the form with the botanical names listed alphabetically. For wild collected seed, country-of-origin is necessary; other site information is appreciated. The remaining information (height, flower color) can prove useful, especially if there is variability in the species and is required if the species name is unknown. Canadian and overseas members: if you are not using the NARGS donation form, please write “Unless otherwise stated, all seed originated in the donor’s country” at the top of your list of seed donations; it is required for the USDA Plant Inspection. List all the seed that you are sending. Any seed that is not listed on the donation form will not be allowed entry and could delay the entire shipment beyond our seed list deadline. In addition, the seed of genera that are on the CITES or ESA list must include the full name of the species to indicate that it is not a restricted species. Place securely sealed seed envelopes and completed Donation Form in a padded mailing envelope or box. If using regular mail envelope, be sure to wrap the seed packets within plenty of padding inside the mailing envelope; postal sorting machines will crush seeds that are not well protected, making them unusable. Mail your donation to the Intake Manager (address below under Questions and on the Donation Form) as early as possible. DO NOT SEND SEED TO ANY OTHER ADDRESS. You may send more than one shipment if you have a lot of seed or some early-ripened seed and later-ripening seed. For USA MEMBERS - Seeds MUST BE RECEIVED by November 1. No item can be added to the catalog after that date. You must use the permit and green & yellow mailing label which will be with the Summer edition of the Rock Garden Quarterly or which can be obtained from the Intake Manager. Please follow instructions below very carefully or your seed will not reach the exchange. Because the seed goes through the Plant Inspection Station first, in order for it to be received on time Canadian & Overseas members’ seed donations MUST BE MAILED BY 15 OCTOBER. Seed arriving late may not arrive in time to be listed. Copy of the USDA Import Permit with the white mailing label still attached to permit; Plant Inspectors will apply this label to forward the seeds to the Seedex Intake Manager after inspection. Secure the green & yellow shipping label (attached to the import permit) using adhesive tape (do not glue) as the only shipping label on the mailing envelope; it will direct your seed to the U.S. Port Inspection station. Inspectors must be able to easily remove the label before forwarding shipment on to us. DO NOT put the white shipping label from the import permit on the mailing envelope! There is a limit of 50 seed packets per shipment for Plant Inspection. If you have more than 50 packets to send, or you mail early and plan to send a second shipment of seed later, please request another set of the import permit and mailing label from the Intake Manager as soon as possible. Individual seed packets must not exceed 10 grams (or 50 seeds if large seeds); you may divide the seed into two or more packets to comply with the weight restriction, but each packet counts towards the 50-packet limit per shipment. If you are sure you will have late-ripening seed to send after November 1, you must send a list of those seed names to the Intake Manager for inclusion in the catalog by November 1 and mail the late-ripening seed to arrive by December 1. This special service may be used ONLY for late-ripening seed; it is NOT intended to provide donor numbers to procrastinators and you MUST send all other seed you have collected BEFORE the November 1 deadline! The most frequently ordered items in the Seed Exchange are from small, highly ornamental alpine plants, especially those collected in the wild. Seed from very unusual plants, especially from temperate climates, as well as woodland plants and the seed of uncommon bulbs are also much desired. Always highly sought are seeds of Adonis, Arisaema, Cyclamen, Edraianthus, Erythronium, Fritillaria, Hepatica, Paeonia, Trillium as well as some of the smaller or rare species of Aquilegia, Campanula, Clematis, Eritrichium, Gentiana, Lewisia, Penstemon, and Primula. There is also a small demand for easily grown ornamental garden standards, but in this regard see comments on the Unacceptable Seeds below. Seeds sent without species designation (listed as “sp.”) are rarely requested, unless of highly desirable genera. North American members, in particular, are urged to collect more seed of alpine plants in the wild. Large quantities of seed of large plants like Clematis cultivars, Eryngium or Eupatorium. Confirmation of your seed donation will be sent by email if you include your email address on the donation form. Otherwise, the list of all donors and donor numbers will be included in the Seed List. Do not send requests for seed to this address. The NARGS Seed Exchange Seed List and online ordering will appear on the website on December 15th - so mark your calendar!